Multiple reference station RTK (real-time kinematic) is a complex, yet natural extension of single reference station RTK. Single reference station RTK actively and dynamically measures GNSS measurement errors, most notably satellite orbit, troposphere, and ionosphere errors. These measurement errors are characterized by their spatial correlation. To this end, in single reference station RTK, the errors are assumed to be constant everywhere around the reference station. In reality however, because the errors are not constant, the quality of these error estimates degrade as a function of distance and can reach an unacceptable level for ambiguity resolution after tens of kilometers. 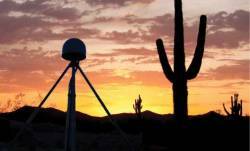 One approach to ensure an acceptable level of measurement error over a wide geographic region is to deploy many reference stations, each operating independently. Once this infrastructure is in place, users select the reference station that will provide them with the greatest reduction of measurement errors and apply the corresponding corrections in the traditional single reference station RTK approach. Unfortunately, the decision of which reference station to use can be problematic especially when the user is located between reference stations with nearly equally spacing. The estimated measurement errors at each of the reference stations may be different but the user is forced to discretely choose one or the other. The solution to this problem is multiple reference station RTK. Instead of choosing the solution from one reference station or another, the multiple reference station solution allows users to combine the estimated measurement errors at each of the reference stations and smoothly transition from the errors at one reference station to another. The multiple reference station solution is not only better because of the ease of use when transitioning between reference stations but also because the smooth combined solution is more likely to represent the user-observed measurement errors. This provides an even further reduction of user measurement errors, relative to the single reference station case. The main advantage of multiple reference station RTK stems from the improved user performance. However, the improvement in performance can also be analyzed in an opposite manner, namely, as a way to increase the spacing between reference stations while still achieving the same level of performance. The performance improvement depends on many factors, including the variability of the measurement errors in the region and the ability to successfully resolve network ambiguities. Multiple reference station RTK is more robust against station outages because a network solution can still be calculated even if individual reference station data is missing. However, due to the current trend of sparse network station spacing, the absence of any individual reference station would likely cause pockets within the network with less than desirable performance. Even under these conditions, the network solution is still more likely to provide a solution better than that from a single reference station. This improvement comes at a cost of increased complexity and infrastructure. The data from all of the network reference stations must be collected in a central location for processing and then redistributed to network users. The cost of maintaining a processing center and data communication links for each reference station may be significant, depending on the number of reference stations and the country and region in which the network is located. GNSS Solutions is a regular column featuring questions and answers about technical aspects of GNSS. Readers are invited to send their questions to the columnist, Prof. Mark Petovello, Department of Geomatics Engineering, University of Calgary, who will find experts to answer them.